I will be giving another lecture this week on Massachusetts at Gettysburg…one of my favorite topics. Good time for another installment of anecdotes relating to Massachusetts units at the Battle of Gettysburg. 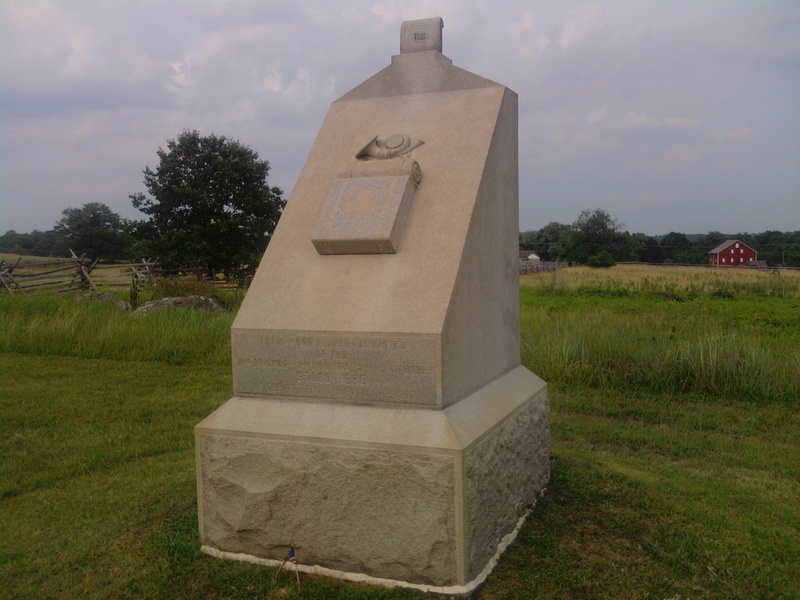 13th Massachusetts Infantry: On the morning of the first day of battle, July 1, 1863, the 13th Massachusetts Infantry, (Paul’s brigade, Robinson’s division, I Corps) was rushed into place on McPherson’s Ridge northwest of town. There the I Corps met the overwhelming numbers of Confederates streaming in from Chambersburg. The 13th formed the extreme right of the I Corps. There was a half-mile gap between them and the men of the XI Corps on their right. This left the 13th Mass dreadfully exposed. With heavy fire coming in on three sides, the 13th still managed to stick to their position along the Mummasburg Road. They scored something of a victory when a North Carolina regiment tried to dislodge them. Advancing across the Mummasburg Road, which was sunken, the Confederates had a rough go of it and the 13th Mass inflicted terrible damage, some of the men shouting, “Give it to ’em for Fredericksburg!” Most of the Confederate regiment surrendered and the 13th Mass took 132 prisoners. Soon, however, the XI Corps on their right utterly, and infamously, collapsed. The I Corps was obliged to do the same and the 13th Massachusetts found themselves retreating pell mell through the streets of Gettysburg…streets that had already been occupied by Confederates! “Over fences, into yards, through gates, anywhere an opening appeared,” wrote the regimental historian, “we rushed with all our speed to escape capture.” I can’t imagine the confusion. The 13th Massachusetts did manage to reform on Cemetery Hill south of town, but 98 of them were captured during their scramble through town. 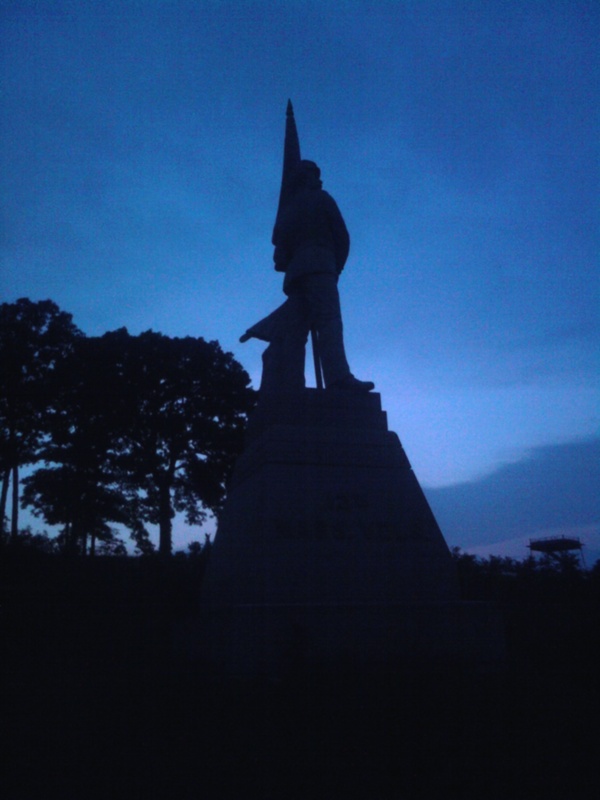 The 15th Massachusetts Infantry monument on their position near “The Angle” during Pickett’s charge, July 3. In the background is the Codori Farm, their position on the previous day where they suffered their harshest casualties. 15th Massachusetts Infantry: The 15th Mass (Harrow’s brigade, Gibbon’s division, II Corps) also ended up on an exposed flank. Their turn came on the second day of battle, July 2, 1863. The 15th, along with the rest of the II Corps, was still marching to Gettysburg on the first day. The camped about three miles from town on the night of July 1. The next morning, at about 10 a.m., their brigade was moved to Cemetery Ridge where they stacked arms and waited. That afternoon, General Sickles made his perplexing (and insubordinate) decision to move his III Corps forward to the Emmitsburg Road, breaking up the Union line and seriously exposing their left flank. The men of the 15th Massachusetts watched them go forward and wondered, anxiously, what it meant. 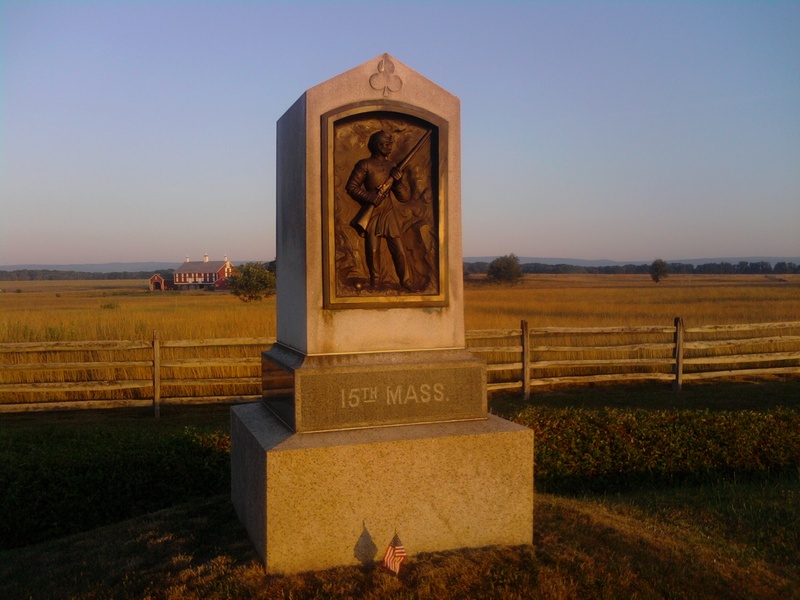 General Gibbon of the II Corps saw the need to bolster the right flank of the III Corps so he sent two regiments forward, the 15th Massachusetts and the 82nd New York, to occupy a position on the Emmitsburg Road north of the Codori farmhouse. Not long after the III Corps moved forward, the two regiments advanced about 400 yards in front of the rest of the Union troops on Cemetery Ridge. The 82nd placed their left flank on the Codori house. The 15th Massachusetts formed on their right with their right flank hanging in the air. Sensing that they were in a bad spot, the men quickly tried to throw together breastworks. They were not aware that General Ambrose Wright’s brigade of Georgians was headed straight for them. When the onslaught struck, the two regiments held tenaciously. This despite receiving fire from the Confederates as well as friendly fire from the II Corps artillery behind them, whose missles repeatedly fell short and landed among the ranks of the 15th Massachusetts. The 82nd fell back first. Then the 15th Mass had no choice but to retreat. Some stalwarts who would not give their position on the Emmitsburg Road were there captured. Their colonel, George H. Ward, was there mortally wounded. It was the opinion of several general officers on the field that the defense provided by these two isolated regiments prevented the Confederates from getting behind the right of the III Corps and cutting them off from the rest of the army. 19th Massachusetts Infantry: Colonel Arthur Devereux of the 19th Massachusetts Infantry (Hall’s brigade, Gibbon’s division, II Corps) was a stickler for drill. Prior to the war, he had been captain of the Salem Light Infantry, a Zouve company which prided itself on precision drill and performed in front of large crowds. The Salem Light became part of the 8th Massachusetts, a 90 day regiment, at the start of the war. Devereux then became colonel of the 19th Massachusetts. On the third day of the battle, the 19th Mass was one of three Massachusetts regiments at the Angle where Pickett’s charge momentarily broke through. At that moment, Major General Winfield S. Hancock, commanding the II Corps, rode by and Devereux called out to Hancock, “They have broken through! Shall I get in there?” To which Hancock replied, “Go at them!” The 19th Massachusetts and the 42nd New York together filled the gap, entering a pandemonium of hand-to-hand combat. In the brutal fighting, the 19th Massachusetts captured four Confederate regimental flags which Devereux personally delivered to his brigade commander after the battle.